Doesn’t illuminate much, and it would be worth knowing why she is staying on three additional weeks–presumably continuing to pull down her hefty salary. We firmly expect the full story behind Pinto’s resignation will be known soon enough, and we’ll update when we hear it. Pinto oversaw the contract of public relations firm Novitas Communications to replace several staff positions left vacant in a department traditionally filled with district employees. The move drew criticism in the politically charged district, particularly from supporters of the Jefferson County Education Association. 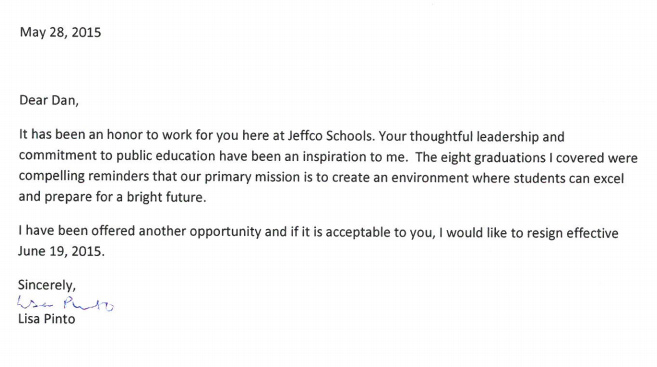 Jeffco Public Schools chief communications officer Lisa Pinto has submitted a letter of resignation and will be stepping down from her position effective June 19, according to a district staff member. Pinto was hired on at a salary of $126,678 in January by schools Superintendent Dan McMinimee. We’ll update as soon as we receive more information. We assume a statement is being drafted and spell-checked now. That’s the word from multiple sources Thursday afternoon–embattled Jefferson County Schools Chief Communications Officer Lisa Pinto is resigning from her position, following months of disastrous press for the conservative board majority, revelations about alleged discrepancies in her resume that emerged during the candidate search for her position, and most recently an investigation into alleged bullying of a minor student during a public board meeting. We’ll update with details once available, stand by. Nah, GOPers always fail upwards — it's a law, or something . . . In line for a Republican Party chairman position. 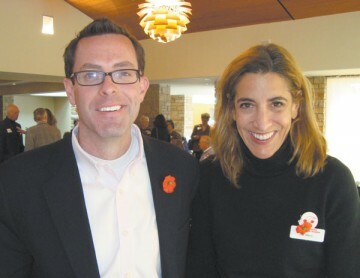 That photo of Ryan Call and Lisa Pinto looks like they're doing a commercial for Match.com. More like vampire mistress and feeder minion. Why not? The last school board meeting was an epic communications disaster. Someone has to take the fall and it won't be the big wigs. Lowly female gets axed to show how serious the big dogs are about reform. Thursday was the last day of school, so maybe it had something to do with that. Damn. I was hoping for a conspiracy with legs. Sooner or later one just has to walk away from talk about burritos. She not only didn't help the majority's image, she just piled on. What a piece of work that one. Rule 1 for PR flacks: Don't become the story. Wow! This could give political cronyism and featherbedding a black eye! I wonder how the outside PR consultants will spin this for the board? Easy. Obviously a problem that was foreseeable and could have been easily avoided if you had only hired us? I'd type out press releases for those morons for $50K. I'll do it for $45K and the occasional secret lunch at Jose O'Shea's! And as far as my conservative credentials go, I need only point to the Ted Cruz rap video I posted today in the Friday Open Thread. She can't leave! I still haven't gotten my goddamn burrito! Seems odd for ColoradoPols to cite ColoradoPols as evidence of "disastrous press"
That's why they didn't. They linked to a prior blog post about disastrous press, with links to actual disastrous press. Are you even trying today? Is anyone curious about this other "opportunity?" Anyone who can do a simple Google search would see that this woman was a disaster in her job. It can't possibly be in public relations. So she'll end up working for a conservative group or one of their donors. Her only job was to support their agenda. She did what she was asked, she'll be brought back into the fold. Pinto is actually an alien from the planet Aynrandia. Her alien overlords originally planned to spread Libertarianism across the universe, but, after being laughed off of several, more advanced worlds, the alien Council decided to start smaller, in a galactic backwater– Jefferson County, Colorado. They created a back story by sending her to a couple of AFP meetings wearing a "Get your Kenyan socialist hands off the Medicare I need because my fracking job had no pension (which is just fine by me, I have a job greeting at Walmart!)" T-shirt with a picture of Obama with a bone through his nose on it. Then, they set her up with a PR "business" that she runs out of her home, but there's no evidence she's ever P'd any R's, but that's OK because she's an "entrepreneur" and the T-shirt. Then, after their plan seems to be coming together so well, suddenly the idiots on the school board start acting like complete a-holes, which means Pinto will have to write things, and the Council just noticed that her academy records indicate that she never completed her courses in the alien language "English," and that may be a problem since she's in a job where her sole purpose is Englishing things. In a final desperate attempt to retain their presence on this promising, foolish world, they extract their operative from Jeffco and put her in the only safe place they know– with the agent they sent earlier, Jon Caldara at the Independence Institute. I like it. Gordon Klingenschmitt is another candidate for possible alien plant. He thinks that he's Saint Patrick now, banishing the "snakes", i.e. gay people, from Ireland. Didn't those snakes amount to 62% of the folks who voted? It lost in only one county or district, I forget exactly how their system works on nationwide votes. But the one place it lost the no vote was just 51%. And I bet Klingenschmitt's constituents still aren't embarrassed.